Welcome to Nevena Tacheva’s page! Belly Dance Instructor and Award-Winning Performing Artist. Learn to belly dance with Nevena Tacheva in Bonn or Cologne, Germany or schedule privates over Skype. Treat yourself to oriental dance classes from a professional qualified instructor! I believe in you! 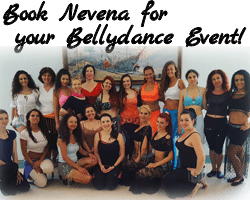 Book bellydance artist Nevena (Bonn, DE) for your dance event! You can request workshops (baladi, classical oriental, tarab, pop song, shaabi, tabla solo, technique a la Nevena Tacheva) and a show.